Pediatric Dentistry: Alabama #1, Roll Tide! In Alabama, college football is life. The seasons and years are measured by the football schedule and winning records. The University of Alabama football team won the championship game last night against a great University of Texas team. It was not because any one player excelled. Heisman winner, Mark Ingram is a great player, and he had a great game. After being hit, he continued for several yards after contact. His great runs were opened up by good blocking, and the threat of the pass and other great running backs. An outstanding defense held the line against a powerful offensive machine. 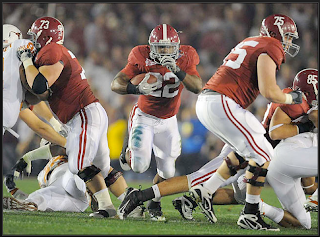 SEC football is characterized by great defenses and a strong running game. Me and my family have atended several Alabama games in Tuscaloosa. At the stadium, there are statues of Paul "Bear" Bryant and other national championship coaches. There is also an empty pedistal for the next championship. Alabama expects to win. It has been a long time. Congratulations Alabama, Roll Tide!